Happy Sunday! When I went shopping with Britt last week before shooting and the IAFBC I spotted some gorgeous Kimono’s and I actually bought one (the inner Kimono in the upper right corner ;)). The pictures I made with this gorgeous new item came out great! You will see the result soon, I promise ^^ But I noticed their are a lot of Kimono like cardigans in stores right now. 2014’s spring season is all about pastels, flower prints, asian prints and also fringes are hot again. I really love the Kimono print, it just fits really well with the other trends and it is a very wearable trend. Kimono’s are chic but are very comfortable too. Besides that you can style a kimono like one of the examples above in a lot of different ways. On a skinny jeans, on a tight pantalon, on a slim midi or maxi skirt (in case of a somewhat shorter kimono). So if you like these kimonos, don’t hesitate to buy one. I can assure you, you will be very happy with your purchase since you can style it in many many ways! Today I am having a quality time day with my boyfriend, I always love these days no matter what we are doing haha. Earlier this week I already told you I will be going shopping on Tuesday and well I still need the perfect Fedora hat. 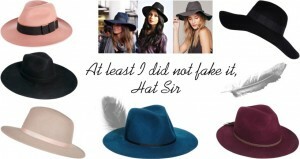 So this weeks trend report is all about fedora hats! Fedora hats are really cool to style with a casual or basic outfit as the statement piece. As u can see in the collage above fedora hats are available in tons of colors, not only black or grey but also beige or pink, yay! Personally I am super in love with the pink and beige fedora hats on the left but the black one on the right is gorgeous as well. I would style the fedora hat (depending on the weather of course) with a biker jacket, tee and jeans or maybe with a jumpsuit. PS: Doe jij al mee aan de winactie i.s.m. Zalando? How has your weekend been? Mine has been super relaxed. I went to a part of Hollland with a lot of nature and old farms with family. It was just so nice to not be busy with social media, internet (although I was said the wifi did not work yesterday evening haha) and work. Today I want to share a trend report from a trend I started noticing when I was shopping last week. Wide sleeves, flared jeans, wide wavy skirts, flared clothing is HOT! Luckily it does not only give me a seventies / hippies feeling, flared clothes also have a elegant touch to it. Personally I am not yet convinced, I do like the tops but the flared jeans, I just don’t know. But I would definitely like to try this trend and explore my options since this trend is just wearable by almost everybody. For example: a flared jeans or pantalon accentuates your waistline and it actually makes you look taller. Style a flared jeans with a chic blouse or pretty top. The other way around you could style a top with wide sleeves with a chic skinny jeans. Voila! 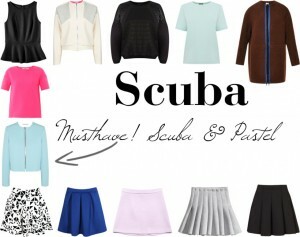 In the collage above you can see some of my favorite flared items, you definitely should have these items in your closet if you ask me ;). 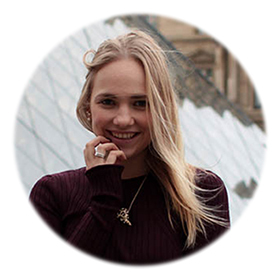 It is Sunday already so time for a new trend report! Since this years color, according to Pantone, is Radiant Orchid I need to do a trend report on this beautiful color! Fashion wise this color is just gorgeous and I think we’ll definitely see it a lot in stores and on the runway as well! 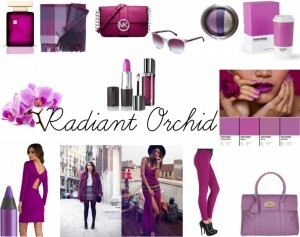 Radiant Orchid comes in different shades, from a sort of darker lila to a deep red-ish purple. In the Polyvore collage above you can see some items but you also see two very beautiful looks with Radiant Orchid items… I for sure would immediatly buy that faux fur coat or that lovely hippy style dress!